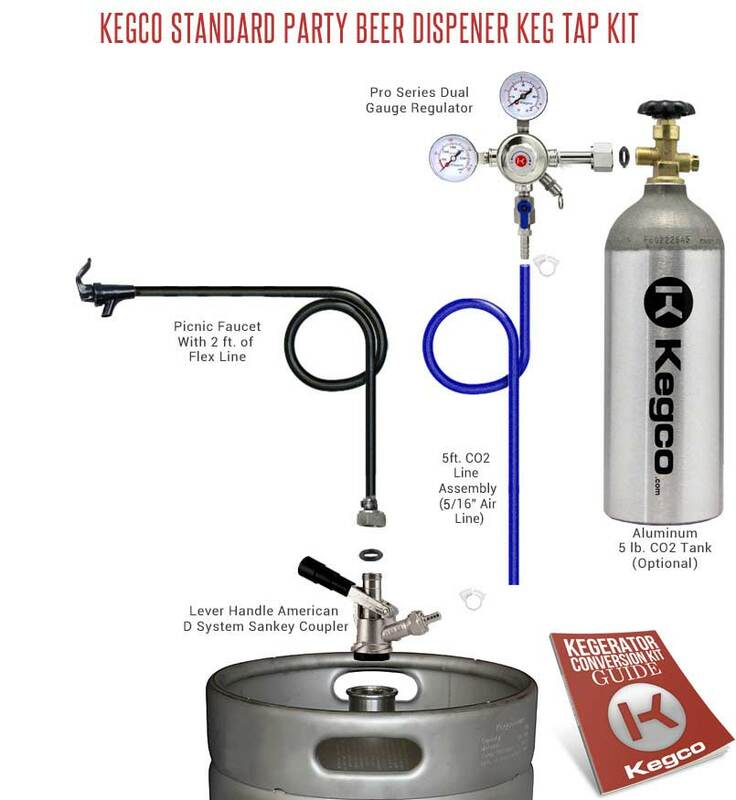 Thanks to Kegco's Standard Party Kegerator Kit, you can now have all of the convenient features of a home kegerator without the hassle of drilling through a refrigerator. Because this setup uses no shanks or towers, there is no installation required - all you need is a refrigerator large enough to hold a full size keg, and you'll be dispensing pour after pour of cold draft beer in no time! Unlike regular party pumps, your beer will not go flat if you cannot drink it all in one night, so you can enjoy delicious fresh taste until the last drop. The Standard Party Kegerator Kit has been designed with high quality commercial-grade parts that blend convenience and user-friendly performance with professional level power and craftsmanship, including a dual gauge regulator that allows you to easily monitor both the CO2 volume and the output pressure, and a lever handle coupler that is more durable and long-lasting than wing handle couplers. Easily measure PSI and Co2 volume and adjust Co2 output pressure using this pro series dual gauge regulator packed with premium features! The top gauge indicates output pressure, while the side gauge tells you what's left in the Co2 tank, so you don't run out of gas during a party. The chrome plated brass body has a large pressure adjustment knob for easy use and includes a manual pressure release valve. This is a black plastic party pump squeeze faucet with two feet of black 3/16" I.D. beer line. This is the faucet you see installed on all picnic keg pumps. This faucet comes with a hex nut assembly that will attach to the top of all standard commercial keg couplers for easy assembly. WARNING: This product can expose you to chemicals including lead, which is known to the State of California to cause cancer and reproductive harm. For more information, go to www.P65Warnings.ca.gov. We offer the Co2 Tank as an optional kit component because many people already have one or would like a large tank size. All of our brand new tanks are made from high strength aluminum alloy which is not as heavy as a steel tank and will not rust. If you do not already have a tank, we highly recommend you take advantage of our incredible low price on brand new Co2 tanks. Easily measure PSI and Co2 volume and adjust Co2 output pressure using this pro series dual gauge regulator packed with premium features! The chrome plated brass body has a large pressure adjustment knob for easy use, and includes both a manual pressure release valve and an integral tamper-proof safety pressure relief valve that releases at 45-psi. Our brewery-approved thermoplastic vinyl beverage hose not only meets but exceeds all of the rigid demands for beer dispensing systems. The blue 5/16" I.D. beer line remains flexible and durable at recommended temperatures and pressures, is unaffected by normal cleaning compounds, and will not rot, swell, or dry out. This easy-to-use white plastic snap clamp fits 5/16" I.D. (9/16" O.D.) vinyl hose. A tooth-locking mechanism allows you to tighten the clamp without using tools, and the semi-rigid plastic design is reusable and will not corrode over time. Some gas suppliers will not fill a CO2 tank, they will only exchange your CO2 tank for a full one. It is a good idea to find out what options are available in your area so that you don't buy one of our brand new high quality aluminum CO2 tanks, only to have it swapped out for a rusty old steel tank. If you are unsure where to get a tank filled in your area, you can try asking a local beer distributor or doing a local search for fire extinguishers and fire safety equipment. Companies that refill fire extinguishers are generally willing to fill a CO2 cylinder. All additional technical questions can be handled by one of our friendly technical support staff by calling toll free 1-800-710-9939. Comments: Great product. Simple to use. Instructions are easy to follow and very helpful. Performs perfectly. Only wish I had bought the tall stand dispenser. Comments: Good purchase. The trick is to find somewhere to fill the tank without exchanging it for a beat up steel bottle. I went to keller fire and saftey inc. 5 lbs for $12. I went to a home brew store with the kit to get some pointers and tips. He informed me that I was missing a ball and retainer clip from the tap. That would have ruined the party! A quick call and parts were on the way. Tap and gauges are cheaply made but still not disappointed for the $. Comments: I ordered the kit for our Super Bowl party, it was an excellent addition! No more pumping, and no more stale beer. I combined it with a keg insulated wrap. I hooked it up before the party, pretty easy with the clear instructions. It worked like a champ! The order arrived in good condition in 3 days. I'll definately use The Beverage Factory for any future beer dispensing needs.